There is a legend which is very much alive in the city of Lecco. A romance set in the XVII century about two lovers fighting the odds to stay together. Because the story, the locations and the characters are so rich and detailed, it’s easy to fuddle folklore and fantasy for fact. I Promessi Sposi known in English as The Bethrothed by Alessandro Manzoni, tells the story of how the faith of two lovers, Renzo and Lucia, overcomes all obstacles to their union despite the efforts of the villain, Don Rodrigo, who has evil designs upon Lucia. I Promessi Sposi is not only known as a great literary work, but is studied and celebrated for it’s vivid descriptions and accurate narratives of historical facts that are worked into the fabric of the story. Alessandro Manzoni (1785-1873) spent the first 20 years of his life in Lecco in the mansion house, which today is Villa Manzoni, a house-museum. As a young adult, he moved to France and later returned to Milan, Italy where he spent time in the company of aristocrats, philosophers and politicians. He wrote The Bethrothed, his greatest masterpiece, between 1821 and 1825 setting the scene in his hometown of Lecco and the surrounding areas, which at the time was vast, open agricultural lands and small fishing villages along the shores of Lake Como facing the majestic backdrop of the pre-alp mountain chain. The Bethrothed is obligatory reading for all Italian high school students and is studied in university-level European Romanticism courses throughout the world. Lake Como Food Tours have created the Tour Manzoniano; a walking tour that will soon be offered regularly to the public. The tour is led by a certified tour guide and starts in the center square of Lecco. The tour leads you through the antique, cobblestoned streets, with stops at noteworthy landmarks and explanations of the significance in history as well as in the story. 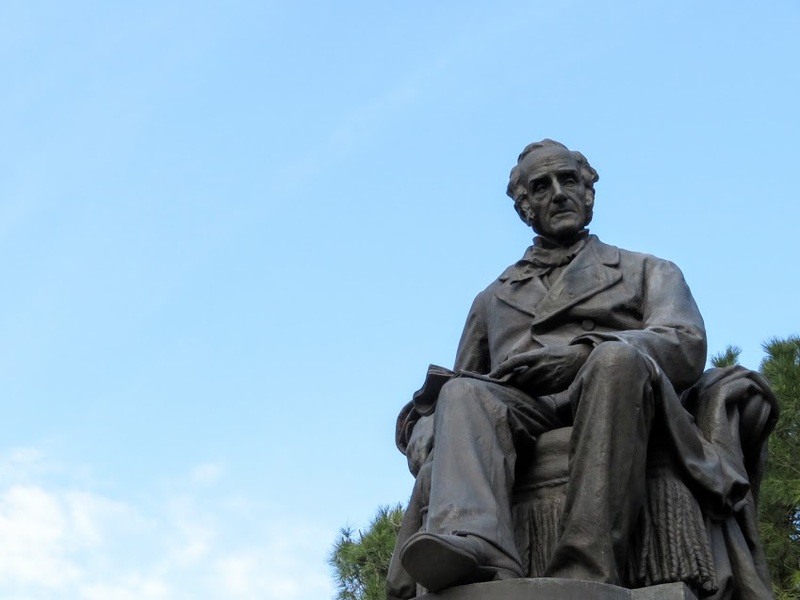 The tour then leads to the bronze statue sculpted by Francesco Confalonieri dedicated to the author and scholar. Important chapters of the romance about Renzo and Lucia are depicted on the base of the statue and serves as a noble reminder of how love and goodness always overcome darkness and evil. The tour continues to the quaint village of Pescarenico; scene of one of the most touching scenes of the book. In the story, Lucia has escaped from the evil lord, Don Rodrigo who is trying to kidnap her. She cries out bidding farewell to her homeland, not knowing if she will ever return. Her words are full of grief and emotion, which during live performances of this passage is a truly powerful scene. In the church of Pescarenico, a secret is revealed about one of the main characters; Fra Cristoforo. The tour finishes with a visit to the villa and a first hand experience visiting the salons, chapel and garden of Manzoni’s childhood. It’s a fantastic tour to see the town of Lecco and learn about the local legends surrounding Manzoni and I Promessi Sposi. At the moment, the tour is only available in Italian, but there are plans to open it up to other languages.